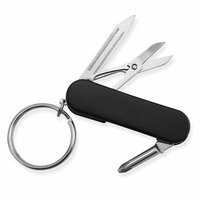 This Black Key Ring Pocket Tool is equipped with 3 stainless steel tools: nail file, scissors, and phillips head screwdriver. Black anodized finish allows for clean, crisp laser engraving. Airport safe. Black anodized finish. Size 3.875" long when open.